Have you ever seen those pictures of the perfect laundry rooms? Maybe your facebook friend remodeled or maybe you are just flipping through the latest home and garden magazine for inspiration. Well, I’m here to let you know that has never been my reality. In fact, very little of my life is pinterest perfect. Actually none really, if I’m telling the truth! So here is an honest peak into my house. I didn’t pick up before snapping my messy house pictures. These are for real! Welcome to my messy life! In our last house, we actually had a separate laundry room. Well sort of… It was a room in the basement with no door that had a toilet in the corner, with a shower spigot next to it and the washer and dryer next to that. It was classy. You know…brick walls, no door. If you wanted to leisurely read on the toilet, you could do so while keeping the laundry running. Multi tasking at its best. We did upgrade the room eventually. We added tile floors and painted the walls white so they were no longer dingy and stained, but that room never became Pinterest perfect or achieved facebook bragging rights. After living in that 750 square foot house for 5 years, we upgraded to a bigger house on 3 acres. The main floor needed a complete remodel. We borrowed and penny pinched our way through $50,000 in renovations, but unfortunately, we never touched the basement. Yet again, my laundry room is in the basement. Only now, we have 8 children instead of 2. Here is a fun fact about having lots of children. You would think it would cost a fortune to clothe them. But, it doesn’t, because once you have a bunch of kiddos, you are the target of every generous heart out there willing to give you second hand (and new) clothes. The dillema is, they come in trash bags…often multiple bags at a time. The Lord has been good and usually there are some great items in those bags. I take what I need and then probably a few more (because little boys think clothes are disposable and manage to destroy good clothes on a regular basis). So back to my dilemma…there are bags of clothes leftover. Clearly I need to improve my method for passing along these items because they end up sitting in my basement for a couple of months before I send them to the thrift store. This is of course on top of the mountain of clothes we have that we are keeping. 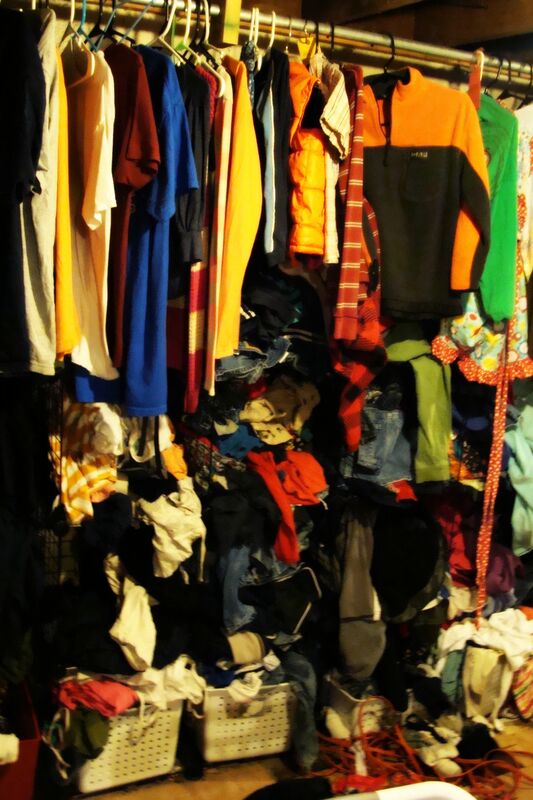 Some people wonder how we keep our clothes organized. Years ago, I decided that dressers were a bad idea. Little kids like to pull out the drawers and dump them or change their outfits 5 times a day. I’m not a terrible housekeeper but I’m not great either and who has time to constantly refill drawers or do the sniff test to sort out the clean from dirty on the bedroom floor. Not me! So, I decided to defer to the method of using a family laundry closet. It is brilliant after all…you don’t haul laundry baskets up stairs only to have them dumped all over. You don’t have unsorted baskets left in the livingroom to become dress up clothes for the little kids. If they are unsorted, they stay out of sight and keep the rest of the house from looking like a wreck. Clearly I had a problem getting laundry folded in the past, because that really was part of my thinking. Fast forward to today having lived in this house for 9 years. Somehow, we have never remodeled that basement. We have cubby type shelves lining one wall with a long rod above it to hand shirts on. Seems like it should work. As it turns out though, even this method has it’s challenges. The first problem is that kids still go in that room and pull clothes out that end up on the floor. Only now, they are spread on the yucky basement floor instead of a bedroom floor. If they spend much time on that floor they smell musty and need rewashed anyway. The second problem is related to having everyone’s clothes in the same area. Gonna take a shower and need to grab clothes…better check them twice or you might get underwear that are too small or pants that are too long if your sister put them away on the wrong shelf. Clothes get mixed up and put away wrong and as it turns out, cubbies don’t hold clothes in place the way a drawer does. I still prefer this method to a dressers in the bedroom but full disclosure…it isn’t perfect. On the day this was taken, most of the laundry was done and most of it folded, but it still looks messy. 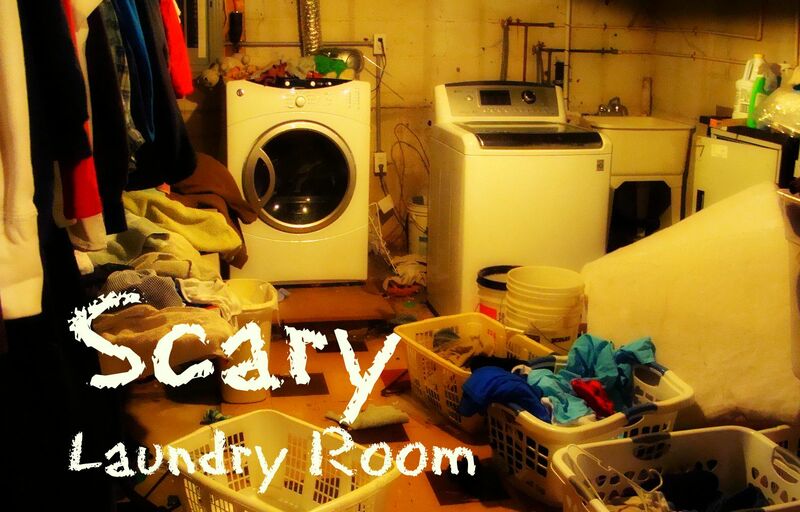 Maybe someday I’ll have a tidy laundry room…probably when my kids are grown…but until then, get real!